While the Mr. and I were headed to another OB appointment yesterday, we noticed something … um.. fuhreaky. 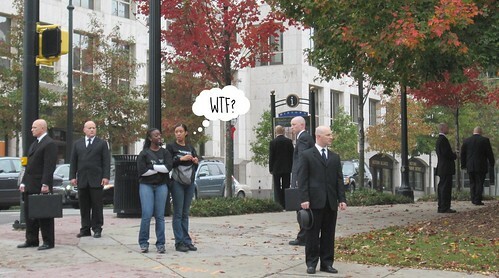 At the corner of 10th and Peachtree, there were not 1 or 2 bald white men in suits, but at least 9. There were groups of them at every corner of the intersection. They all looked a bit lost and kind of wandered from corner to corner. Then by the time the light changed, they sort of moved from the Fed. Reserve Building side over toward the Margaret Mitchell House side of Peachtree. I couldn’t figure out what the deal was – nothing in the papers or blogs. That’s hysterical. Oh how I miss wierd-lanta. Maybe it was viral marketing for Fringe? Based on the preview for this week, there is a guy that looks sort of like that who is pivotal to the storyline. Interesting. Interesting… I know that there was a movie or something being filmed in buckhead last week. Vampire Diaries is a TV show that’s filmed here. Maybe if you stuck around longer you might of had someone pop out of the bushes with a camera. It is a promo for Fringe. They were in multiple cities. The character they were imitating is known as the Watcher. Ah, figures it’s something I’d never watch. You are currently reading Men In Black at mingaling.